" In a chance meeting in the 1980's, I had a discussion with Elie Wiesel, the famous Holocaust author, historian, and teacher. I told him that I had not been able to tell my story. He said that it was my obligation to speak out and to tell the world about the Holocaust. He told me that I had survived for a reason-to tell the world what had happened to my family and to me. Suddenly I remembered that my mother had once told me the same thing-that it was beshert, or meant to be, that I survive to tell the story of my family." For ten-year-old Lazorek Hershenfis in Radom, Poland, life with his family is joyful. Lazorek's father, Israel (known as "Srul") operates a leather-cutting business from the front of the family's sparsely furnished, one0romm apartment, and the family spends idyllic summers harvesting fruit from orchards in the nearby countryside. His brothers Mayer and Abush work as tailors to supplement the family's income, slipping Lazorek occasional pocket money for the movies with friends. Lazorek's sister Chaya is a kindergarten teacher and a playmate especially cherished, whether the game is catch the homemade balls of the challenging "strulkies" with stones. A deeply respected healer in the community, Lazorek's beautiful mother Rivka shows him the meaning of caring unselfishly for others, from the breastfeeding the child of an ill friend as if it were her own and preparing special food for Lazorek himself to making middle-of-the-night visits to help sick neighbor. But what is given does not always appear to be returned in kind, as Lazorek discovers on his journey into the ghetto and the concentration camps. Although Lazorek's father and mother sell much of their jewelry and silver for cash to pay for a visa to Palestine the British mandatory government denies the application. It is then that they lose hope of a better life, and according to Lazorek, events begin to happen so quickly that he runs out of time to be afraid. Lazorek survives and journeys to Palestine, taking the name Eliezer Ayalon. A new life begins.. . but can memories be forgotten? 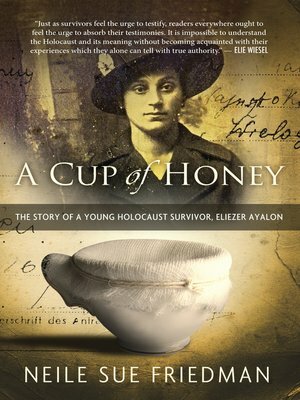 With "A Cup of Hone," Neile Sue Friedman and Eliezer Ayalon impart the richness and endurance of the family love that inspires the Holocaust survivor to perpetuate the lives of those he lost by telling their story. "Neile played an essential role in bringing my part of this history to lights," notes Mr. Ayalon. "I hope that by reading my story, as well as others like it, the next generation will learn the lessons of the Holocaust—that hate and intolerance were defeated by hope and courage."